Get your Wisconsin Dells Tickets! 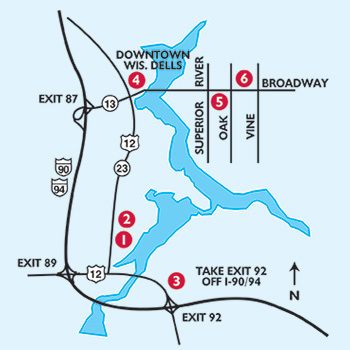 Tickets may be purchased online or at any of these six convenient locations in Wisconsin Dells. Online ticket purchases must be placed at least three days prior to your arrival date. Your tickets will be held for pick-up at our WILL-CALL window at the Tommy Bartlett Show ticket office – open 9:00 a.m., Memorial Day weekend through Labor Day weekend and 10:00 a.m., fall, winter, spring. ID required. All Sales Final. No Refunds. These tickets will not be shipped to your address. You may also purchase tickets in person at any one of our six convenient Wisconsin Dells ticket booths.